The large size of this full length mirror makes it a natural for dressing areas or bedrooms. This Tuscan inspired full body mirror by the Idabel Collection features a weathered ivory wood block overlay design and inner scroll detailing. Distressed details give an aged, heirloom look for comfortable chic that adds style to any decor. Made in the U.S.A. for the assurance of quality construction. 25" wide x 63" high x 1 1/4" deep. Hang weight is 37 lbs. Glass only section is 20" wide x 58" high x 1/4" deep. Surrounding frame is 2 1/2" wide. Creamy ivory and white finish. Wood frame construction. Distressed block overlay for an aged look. 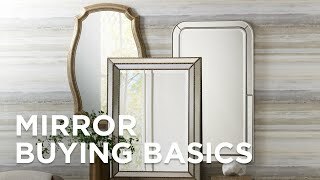 Cooper Classics Senna Distressed Gray 32" x 70"
A stunning large floor mirror accented in a distressed gray finish with an antiqued mirror inlay detail that adds visual intrigue.